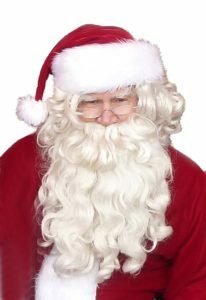 I am Santa Claus, at least I have been him many times over the last 40-some years. 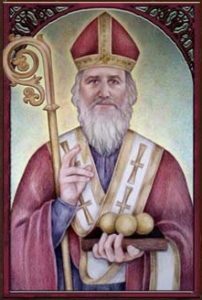 I lay no claim to be St. Nicholas of Myra, the 4th century bishop of Myra in Turkey whose legendary secret giving of gifts is said to be the basis of St. Nicholas, Sinterklaas, St. Nick and Santa Claus. (click here for more on St. Nicholas) I am merely an agent of his, one who dons his attire to spread Christmas joy during the season. Since all of us agents wear the same suit as the Big Guy, it confuses the Grinches and Scrooges as to who is the real Santa Claus. My Santa story begins in 1976, when my parents gave me a Santa outfit for Christmas. I’m not sure why and, alas, neither are on Earth any longer for me to ask. Although I had never expressed a desire to become Santa, I had always been a big fan of Christmas. My parents had loved Christmas as well, serving as my inspirations. My passion for the season endured finding that Santa was the spirit of Christmas instead of the bearded guy in the department stores. That must have been why they gave me the costume, to inspire me to keep the spirit of Christmas in my heart. It worked. The year they gave me the Santa suit, my wife and I started Christmas at my in-laws house in Westminster, CA, having stayed there for Christmas Eve night. Since I had received the suit early, I wore it as I came down the stairs on Christmas morn. Then I wore it as my wife and I drove up the 605 freeway and across I-10 to Claremont, where my parents lived. 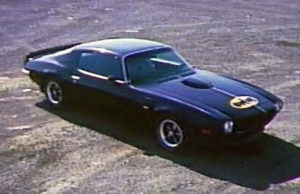 I was driving the first Bat Rod, a ’73 Pontiac Trans Am, with the back seat filled with wrapped gifts. I was in my new suit, beard and hat. Cars would pass me, then suddenly slow to let me pass them. Kids would be at their windows, wildly waving. I returned the wave. I got a big kick out of it. I wonder how parents explained that Batman’s secret identity was Santa Claus. Or was it vice versa? My next fond Santa-suit memory is the next year when I wore it to the company Christmas party. My wife’s parents had started a family business in the the 1950’s and my wife and I opened a second location in 1973. By 1977, we had maybe ten employees there and held our party at one table in a local restaurant. I came as Santa. A couple of our drivers even sat on my knee, giving ludicrous Christmas wishes. Then a waiter came over to me. “There’s a little boy here who would like to meet Santa,” he said. I went over and talked to him. I did it as Santa, keeping in character. The boy loved it and so did I. I was hooked. When my daughter was born, I had a whole new reason for putting on the suit: bringing the magic of Christmas to my child. 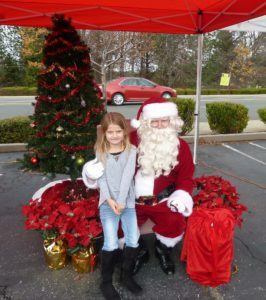 My wife’s parents never gave her a belief in Santa, so she considered it lying and feared that it would cause our child to doubt us on everything else when she found that Santa was a fantasy. But on this I was adamant. I cherished that memory and wanted it for my child. I won. Every year, I would don my red and white attire and come to the front door, jingling bells to imitate my reindeer’s approach. I would bring a few gifts, promising to return later with more. One Christmas Eve, the dreaded moment happened. After I left through the front door and sneaked through the garage to a back room of the house to change, my daughter caught me. She had a feeling that I was Santa and had gone through the house to find out if she were right. I was as devastated as she was that the fantasy was over. After a few tearful moments, she asked, “Will you still come on Christmas as Santa?” When I assured her that I would, she cheered up. Some of the magic would continue. Christmas 1999 with Fionna and our daughter. We had recently returned to the States and our furniture had only arrived two days before. Note the boxes. My most memorable Santa event was in 1990. For some time, our daughter had wanted a dog. But a dog is a big responsibility, a life that becomes your obligation to care for and nurture. My wife was loathe to bring in a canine member to the family, having lost her only dog when it was hit by a car when she was very young. But finally we decided that it was time. However, we gave no indication to our daughter. 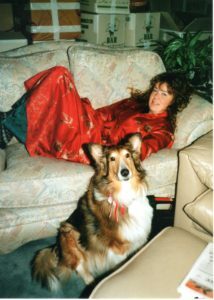 Instead, we secretly bought a Sheltie puppy and set up to deliver it on Christmas Eve. Santa came through the front door with the puppy tucked under his arm. Our daughter broke into tears, sobbing with joy. Several family members watching teared up as well. We have it all recorded. It was Santa’s big day. Our daughter has said it was the best Christmas gift she ever received. She named the Sheltie Fionna. I continued to be Santa, making appearances for my your great-nieces. When we moved to the Isle of Man in 1994, Fionna and the Santa suit went as well. However, the suit stayed in a box in a closet. Father Christmas looks a lot different in the British Isles than the American Santa Claus. When we moved back to the States, the box with the Santa suit and some other items was lost. Perhaps someone needed it more than I. If so, maybe it continued to make appearances without me. In 2003, my wife surprised me with a new Santa suit. The old one had not been expensive and I had added a new wig, beard and hat to make it better. The new one was very classy. It also had an upgraded beard and wig, so it was top notch all the way. A local car club in which I am a member has had an annual toy drive for decades and so I took up the job of the Santa for it. At first, I stood around and waved at people. Soon I had children to meet and greet with a candy cane. Now I sit and hear what they want for Christmas. 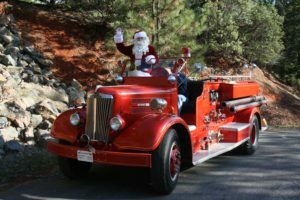 I arrive at the parking lot where the toy drive takes place in an antique fire truck, going through town in an unofficial parade, followed by as many as 50 classic cars and hot rods, The local police have become steadily more cooperative over the years, escorting us and blocking side streets on the way, so that we can all stay together. It is quite a sight. I enjoy waving at everyone as we go. I make it a point to wave to everyone I see. Young women are very enthusiastic, while young men are the least responsive. Yet very few do not return the wave. As Santa, I have made some observations over the years. While most kids enjoy seeing Santa, especially if he gives them a candy cane, the age of belief in Santa seems to stop at about six. Considering what is shown on TV, it’s surprising that their belief lasts that long. About every TV show and movie has Santa pull down his beard at some point. Writers and directors evidently think this witty. I consider it witless. Why do it? To destroy a child’s fantasy? When I am dressed as Santa, I stay in character. I never pull down my beard or do anything else that might adversely affect a child’s belief. I take my role very seriously. I eat nothing and only drink water through a straw the entire time I am Santa. When a child tells me what they want for Christmas, I make no promises. If I did and they didn’t get the gift, what would they think of Santa? If they want a puppy or some other pet (yes, I have been asked for a pony), I say that it’s a big responsibility and they should speak with their parents first. The kids accept that, since Santa is the Man. This year, a little boy asked for a laser tag set. His mother was shaking her head behind him. I said, “That can be dangerous, Why not wait a few years and ask me then?” He shrugged and said, “Okay.” I think a high point as the toy drive Santa was when a lad talked to me for a while, then asked, “Are you the real Santa?” I never lie to the kids, so I asked him, “What do you think?” He studied me, then answered, “I’m not sure.” I had done my job. Yes, I am Santa. At least for a few days a year. This entry was posted in Christmas and tagged Christmas, Santa Claus by RCherry. Bookmark the permalink.